Back in 1990, a close family member of mine gave me a custom blend of ground pepper that he grew. My family member passed away in 1995 and I enjoyed his pepper blend for many years until around 2010 when I started noticing the family pepper supply running low. So I took it upon myself to start experimenting with a variety of different ground pepper blends. After many taste tests and mixing and matching, I found a combination of flavors that I really liked. I decided to share it with my son and some family friends. They loved it and started sharing it with their friends and family. They loved it and the feedback was very enthusiastic! That’s when I knew I had created something worth sharing with the world. A good friend suggested that I name the pepper blend “Blazin’ Bob’s” a combination of my name and the fact that this blend of pepper kicks the heat up a notch on whatever you put it on. Blazin’ Bob’s currently has two pepper blends on the market available through purchase on our site; our Original Hot Pepper Blend and our Smoke Blend. 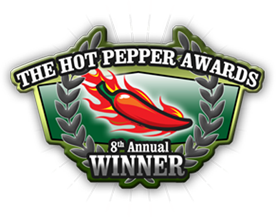 The Blazin’ Bob’s Original Hot Pepper custom pepper blend consists of Cayenne, Habanero and Jalapeno peppers. For Chilehead junkies, this blend has a Scoville Heat Unit of 100K. Our Smoke blend has the same ground peppers but with the addition of hickory smoke which brings the Scoville Heat Unit to 80K. The key to our product is the fact that it’s ground into powder form which dissipates into your food, adds a nice heat and an enrichment of flavor to your food. Blazin’ Bob’s is the perfect condiment to any dish, can be included in your favorite recipes and in your spice rub mix for meat and fish. We invite you to browse through our store, create an account with us or shop as a guest. Don’t forget we offer free shipping on all orders over $75.